slaterat wrote: So the 14/45 has a range of 39,0000 yds , or about 13,000 yards farther than the longest hit ever made by a BB on a moving target in combat. I think we can all agree that the Rodney has no effective real world advantage in gun range. KGV: 38600y with new gun and 36500y with 25% worn-gun. The advantage in maximum range remains in cases of shorter ranges, due to the better angle of incidence, producing a larger number of probable hits on the target (faster m-v gun produces more hits per target). - massively more powerfull projectiles and penetration per range, giving higher probability of massive damage per hit. Dave Saxton wrote: If I read Raven and Roberts correctly the heavy deck armour on Rodney did not extend to over the machinery spaces. Additional, I find the KGV overall protection scheme a significant improvement over that of Rodney. The KGV's belt is external instead of internal, and covers more area, so it is less vulnerable to shells diving under the belt, and it provides better protection of the water plane. KGV is going to need all if its armour protection, though. In post war tests, the Rodney 16" service rounds performed well against heavy armour, while RN 14" and 15" service rounds pulled from inventory at random performed poorly. Neither can penetrate the other's decks (Rodney over the magazines) short of 30,000 meters. Rodney can defeat KGV's belt out to ~22,000 meters. KGV (assuming ROF rounds) can defeat Rodney's belt out to ~18,000 meters. The RN initially purchased 14in AP rounds from Hadfield and Firth-Brown and then switched to Hadfield exclusively before any KGV class ships entered service. 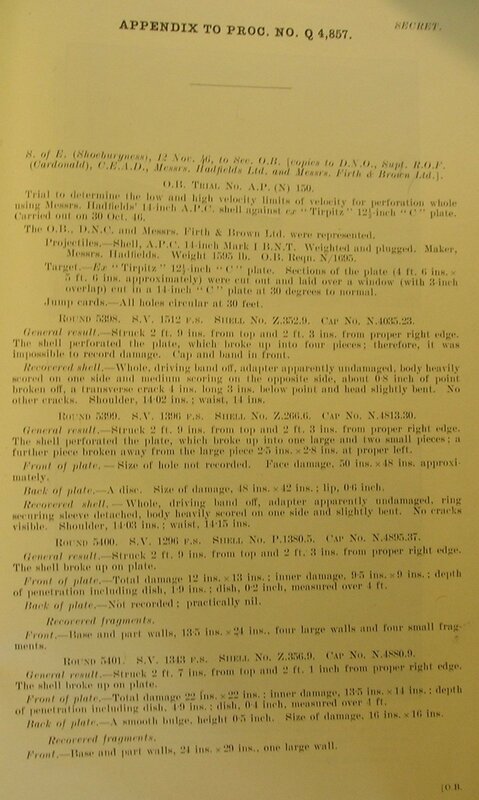 In several dozen proof tests only two Hadfield 14in AP rounds failed after July 1939 onward, and one of those failures was understandable because the round was fired at a very low MV to try and find the lower limit of it's ability to penetrate 12in/30deg plate. I'm talking about the post war tests when all the 14" service rounds tested failed, and only the Nelson class 16" service rounds performed as expected. Selected ROF 14" and 15" rounds did not fail. 16/45 38,000 @ 2,525 ft/sec mv worn gun? Rodney had a mix of mk I and II guns. The RN was dissatisfied with the accuracy of the high mv 16" as the lower velocity 15/42 was more accurate and is the reason they went back to a lower mv for the 14/45. Perhaps you could provide a reference? I know that the RN 14in performed well in post war testing against Tirpitz plates. Rodney AP round with Mk1 rifling = 39090 yds. A late war HE round gave a range of 41690/40890 yds with Mk II/I rifling. With HE shell, the difference is about 3000yards. Perhaps not a big difference, but KGV was outranged no matter how you look at it. There is also the aspect of muzzle velocity, which produced a different time of flight - shorter for Rodney, longer for KGV, meaning faster target aquisition by Rodney's artillery. No, Lion class was building with 16"/L45. Of course not, 350mm vs 305mm was not offset by armor quality. burster charge propells the projectile fragments inside the enemy. It's one thing to propel 730kg of projectile, and another to propel 930kg. If I recall correctly it is among the ADM281 files. I don't have it handy right now. 14" Rounds from the ROF used in tests performed well. It was the 14" service rounds pulled at random from inventory that all performed poorly. The ROF did produce a "Cardonald" 15in AP shell but AFAIK, they never produced any 14in AP and I've never seen any reference to a ROF 14in AP round. These were not tests against Tirpitz plates, but research into new designs going forward. The 14" service rounds failed. The Nelson class 16" service rounds did not. Dave Saxton wrote: These were not tests against Tirpitz plates, but research into new designs going forward. The 14" service rounds failed. The Nelson class 16" service rounds did not. Again, I'd really like to see a source for that info, as the Hadfield 14in AP had a very good reputation. One thing that I've seen missed in this match up is the obvious benefit of Rodney's unique turret arrangement: she can bring all her big guns to bear while presenting a terrifically unfavorable target angle against both her belt and forward transverse bulkhead to KGV. This really depends on the angle, which won't stay fixed as KGV is the faster ship. Also only six guns could fire straight ahead as the rear turret did not superfire over the two in front. This really depends on the angle, which won't stay fixed as KGV is the faster ship. Correct me if I'm wrong, but KGV's speed doesn't have much bearing ( ) so long as Rodney can steer; she needs only to maintain a particular bearing relative to KGV's position. Of course, given the thickness and slope of Rodney's belt, there is some margin for error in any case. A mere 30 degree target angle against the belt, vs 40-45 degrees, would render it proof against KGV's guns down to ~12,000 yards (machinery) to ~10,000 yards (magazines) by NAaB's (v2 out now) reckoning.